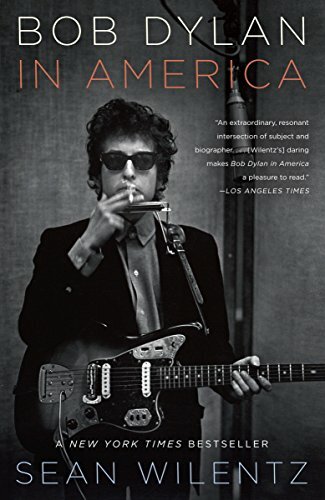 Sean Wilentz’s Bob Dylan in America is a top-notch, first-class synopsis of Bob Dylan’s career, contributions to popular music, status as a cultural icon, and, to a lesser extent, place in the history of American commentators. A person who is taking their first foray into the legend that is Bob Dylan would do well to start here, but the die-hard Dylan-junkies will have encountered much of this material in other familiar works. In fact, Wilentz himself references as sources books, essays, and compilations that many Dylan fanatics will have already ready such as Robert Shelton’s No Direction Home, Martin Scorsese’s documentary of the same name, Ratso Sloman’s On the Road with Bob Dylan, much of Marcus Greil’s work, David Gray’s Song and Dance Man III, John Bauldie’s Wanted Man: In Search of Bob Dylan, and, of course, a truly great book, Dylan’s own Chronicles. In light of this, the natural question becomes, “What actually separates this book from the many other books about Dylan?” First, it is extremely well written. But beyond that, Wilentz only partially succeeds in trying to put Dylan’s work and persona in an historical perspective because he spends a great deal of energy recounting familiar territory, rather than, what a person familiar with Dylan’s work might be led to expect by the title would be the primary focus of the book—the integration of Dylan’s musical genius into the collective conscience of our shared American experience. He succeeds to a vastly greater degree in placing Dylan’s music in the context of how it relates to our American musical heritage and traditions. Somehow, in the process, he also manages to successfully accomplish an almost impossible task: evoking an understanding of how Dylan expands that very landscape and either consciously or subconsciously defines many of these American musical traditions as well as various poetic and literary movements through his steadfast commitment to performing his music live. Wilentz’s continued reference to Dylan as the minstrel couldn’t be more appropriate. Additionally, Wilentz manages to refer to Dylan’s music intellectually in context, without over-analyzing it—a trap that many other biographers fall into. Another highlight is the unique treatment he gives to Dylan’s respect for his predecessors. Dylan’s foray into art is discussed as well as his interest in movies and attempts at acting and producing films. Dylan typically does not come across well in other mediums, but Wilentz rightfully points out that he is more articulate these days, and his movie Masked and Anonymous is a much stronger effort than many assumed it would be. The more recent parts of Dylan’s career make up some of the most interesting parts of the book, perhaps because there has been less written on them, but the album Love and Theft is a masterpiece, his recent tours have been exceptionally strong as compared to his down period, and Dylan’s book, Chronicles, was extremely absorbing. Wilentz addresses all of these in an interesting and enlightened manner. He also emphasizes what many others have as well: the perplexing mystery of the songs that were left off 1983’s Infidels (e.g “Blind Willie McTell” and “Foot of Pride”). Wilentz also discusses Dylan’s ability to incorporate past, present, and future into one as he creates his stories and musical impressions. Wilentz’s storytelling mimics this to a degree to accentuate the point rather effectively, but he often comes across as having some type of inner knowledge on a topic, only to leave the point unsubstantiated, which is at times both troubling and confusing. The best advice is to read the primary source, Chronicles, or better yet, go see Dylan perform live. Then, for a very interesting read for Dylan fans, music lovers, and pop culture devotees alike, turn to Wilentz.